The true Rottweiler is nothing like the unpredictable monster it's so often made out to be. A calm, courageous, affectionate and intelligent breed, these dogs make awesome companions and friends. This breed isn't just stunning to look at, with it's muscular build and shining coat.... but it has a heart as big as Texas and is 100% devoted to it's family. Highly intelligent, calm and confident, they're also suprisingly sensitive dogs who are extremely affectionate, easy to train and very people-oriented. This is 'MY' breed and I've owned and raised Rottweilers for decades. I've raised six children around them, and our multi-pet household includes (or has included) cats, rats, birds and a variety of dogs of different ages, sexes and sizes. 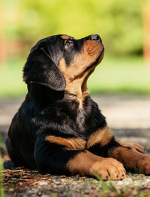 Of course, there are the normal 'spats' from time to time, but I'd choose to own and train a Rottie over just about any other breed, any day of the week! There are no really early records of this breed but they're believed to have descended from ancient Molussus (Mastiff-like) dogs who accompanied the Roman soldiers on their travels throughout Europe many, many centuries ago. Rottweilers as we know them were first seen in Germany and originated in the town of 'das Rot Wil' (translated means 'the Red Tile' referring to the distinctive roofs on the buildings in that area), from where they get their name. Always a working breed, the early Rotties were cattle drovers, guard dogs and companions. Since that time they have also been used (very successfully) as for police work, search and rescue, therapy situations, military work, obedience, tracking, herding, guarding... and of course as beloved family pets. Height: Males 24 - 27", Females 22 - 25"
Color: Always black with rust to mahogany markings. Temperament: Calm, confident and courageous. Intelligent, affectionate and eager to learn. Grooming: Needs regular brushing as they tend to shed more than you might expect for a short-coated breed. 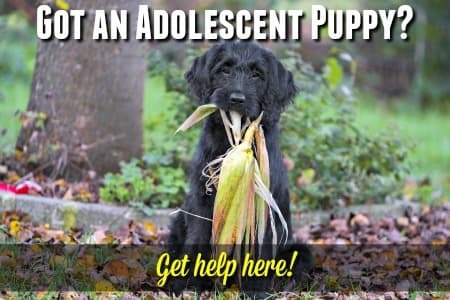 Special Needs: This is a strong, intelligent breed and they need regular and on-going training (using only positive rewards-based techniques) and lots of positive socialization so that they learn to be comfortable around other people, pets and places. Possible Health Concerns: Hip & elbow dysplasia, allergies, skin problems, cancer, bloat, kidney problems. 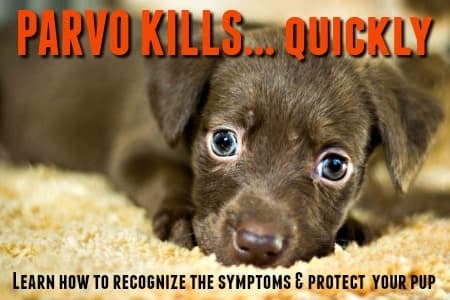 Puppies are extremely susceptible to catching the highly contagious Parvovirus and more likely than many other breeds to die from it. Timely puppy vaccinations are vital and an unvaccinated pup needs to be kept away from other dogs and public areas for his own safetly. The breed owes it's existence to early 20th century enthusiasts who nurtured and shaped the dogs to emphasize herding and guarding instincts. 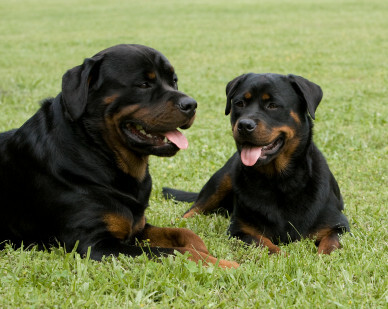 The Rottweiler was first imported to the USA in 1928, and to Great Britain in 1936. Where they found a loyal group of breeders, owners and enthusiasts, and have continued to grow in popularity over the years. The breed was first recognized by the American Kennel Club in 1931. An upswing in popularity during the 1980's and 90's saw them get as high on the AKC's annual 'Top Breeds' list as #4, then they slowly dropped until hitting a low of #14 in 2008. They are currently seeing a revival of interest and last year (2011) they were in 9th place. Due mainly to innacurate and hysterical media rhetoric, bad breeding practices and a sector of the public who wants to breed/own these dogs for the wrong reasons (and who have no idea how to raise a puppy of any breed), they have a 'bad' reputation and have suffered accordingly. However I can say with all honesty, and with years of Rottie-owning experience under my belt, that a well-bred, properly raised, trained and loved Rottweiler is one of the best canine companions you could hope to own. BUT - there is a caveat, they're definitely NOT a breed for everyone. Partly due to their size and strength, and partly due to their intelligence and protective instincts, they're not a good choice for first time owners, people who are physically frail or are not able to be both authoratative and loving at the same time! If you'd like to learn more about this amazing breed, or even find out whether or not they're the dog for you (or you'd just like to see more gorgeous photos!) I'd recommend taking a look at this website www.a-love-of-rottweilers.com It's another website that I've created and it's completely dedicated to this breed. Enjoy!